If the International House of Pancakes wanted attention by temporarily changing its name to the International House of Burgers, it’s certainly working. 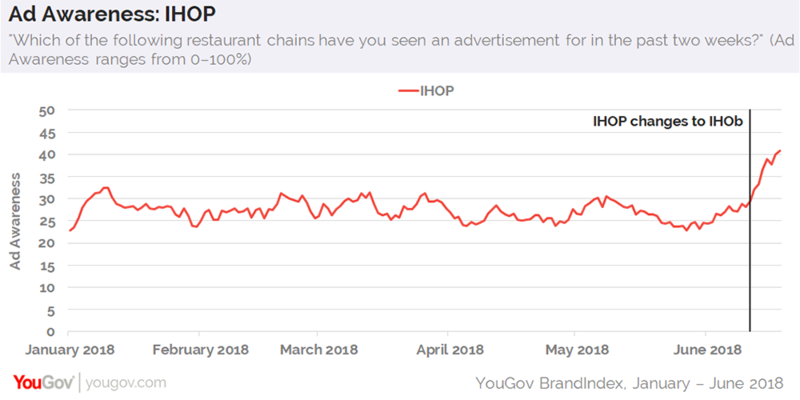 Data from YouGov BrandIndex shows that after IHOP announced the change to IHOb on June 11 to promote its burger offerings, the number of US adults talking about the restaurant chain with friends and family members increased from 19% to 30% (as of June 18). It’s the brand’s highest Word of Mouth score since YouGov BrandIndex began tracking the franchise in late 2012. The accompanying ad campaign has also made some traction. On June 10, when asked if they recall seeing an advertisement for IHOP in the past two weeks, 28% of American adults said they had. At present, that figure has climbed to 41%. What the name change to IHOb has yet to do, however, is create a meaningful boost in Purchase Consideration, which measures how likely consumers are to dine at a particular restaurant chain. A look back to the beginning of this year shows that IHOP’s Purchase Consideration score has remained relatively stable throughout the first half of 2018, swinging mostly between 20% and 30%. Additional data from YouGov Profiles reveals that 27% of current IHOP customers rate pancakes as one of their favorite dishes, compared to 23% of the general public. For hamburgers, the levels of fondness are virtually tied: 28% of IHOP customers consider them a favorite dish, compared to 27% of the general public. Nearly half (49%) of current IHOP customers also indicate that they eat out at least once per week, while only a third (34%) of all US adults report the same.